Whether it is for motorcycle service and repair, or you want to customize your Sportster®, Dyna®, Softail®, Touring or Trike, or Street Glide, Alligator Alley Harley-Davidson is proud to carry a wide selection of Harley-Davidson parts and accessories. If we don't have it in stock, we are happy to order it for you! Our knowledgable parts & service staff will help you find the right parts and accessories to keep your Harley-Davidson® running in it's best condition! If you need help with repairs or installations, check out our experienced technicians in our service department. Custom Harley-Davidson Motorcycles at Stinger H-D.
Want a custom motorcycle? We have the experience and know-how to customize your Sportster®, Dyna®, Softail®, Touring or Trike, or Street Glide. 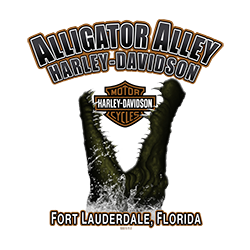 Alligator Alley Harley-Davidson is committed to making sure you enjoy the best possible experience with your Harley-Davidson® motorcycle. Give us a call or stop in and let us plan out your parts & accessories! Any questions on parts and accessories, click the button below.